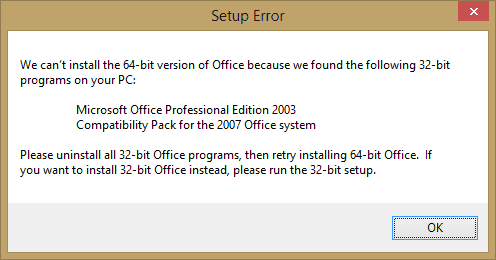 While attempting to install Microsoft Office 2016 or 2013, I encountered an error that said “We can’t install the 64-bit version of Office because we found the following 32-bit programs on your PC…” It provided a list with Office 2003 and Compatibility Pack for the 2007 Office system. To solve this problem, you will need to uninstall all remnants of older Microsoft Office products. Select the “Start” button, then type “Control“. Open “Control Panel” > “Programs” > “Programs and Features“. Look for “Microsoft Office“, “Compatibility Pack“, or anything related to Microsoft Office, and select “Uninstall” to remove it from your computer. You most likely won’t need any of these programs anymore with the new 2013 version. Had office 2016 32 bit installed after much google search got office 2016 32 bit off the computer but then Office 2016 64 bit would stop 1/2 way done and give error about could not install. Steps I used to get 64 bit installed.